A few weeks ago, Katy and I attended the Cortland Arts and Wine Festival, in Cortland, NY. The festival featured almost twenty New York State wineries and over thirty artisans displaying their work. Read a full review of the festival here. After the festival, it was time to get something to eat. Cortland is my home town so Katy and I invited my family to meet us at Brix Pubaria on Main Street, a short walk from the festival. I was excited to try this restaurant since my cousins are partners in the business and my cousin Shannon is the head chef. There has also been a lot of buzz about the restaurant around Cortland so I would have wanted to try it even without the family connection. I love what they did with the space. The building had been the home of several restaurants in the past. 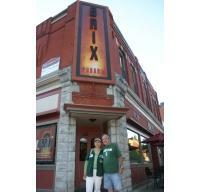 Brix renovated from the ground up and they did a great job paying attention to the smallest details. The large double bar is located in the center of the restaurant with dining areas on each side. The bar was well staffed and had an extensive selection of wine, beer and liquor. There’s a pizza oven and dining bar in the back where you can watch the pizza chefs create their masterpieces. Brix specializes in brick-oven pizza and baked pasta dishes. They offer a variety of other pub fair as well including chicken wings, salads, and sandwiches. We ordered a few appetizers for the table including Roasted Garlic & Honey Mustard Chicken Wings, Rosemary Pizza and Loaded Hot Garlic Chips. The appetizers came out quick and were delicious. The chicken wings had a nice coating of garlic-mustard sauce and were golden brown but were a bit over done. The pizza featured fresh house made mozzarella, fresh rosemary, roasted peppers and garlic, and goat cheese. The thin crust was cooked perfectly and the combination of toppings worked great together. The Loaded Chips were made with fresh cut Idaho potato chips, warm garlic-herb parmesan butter, smoked Gouda & mozzarella, apple wood smoked bacon, chives, onions, cilantro, and a spicy BBQ cream. With these ingredients, how can you go wrong? Some restaurants serve house made chips that are soft or soggy. Not Brix. The chips were thick and crunchy, which is the key. For entrees, I had the Crown City Chicken Riggz, rigatoni pasta with marinated chicken, peppers, spicy tomato cream, and fresh mozzarella. The rigatoni was cooked al dente, as you would expect. There was a generous amount of chicken and the spicy tomato cream sauce was light and flavorful, not heavy like some cream sauces can be. Katy had the Prima with Spicy Tomato Sauce that included baby spinach, Roma tomatoes, mushroom blend, broccoli, onions, mozzarella, over a whole wheat penne pasta. The pasta and vegetables were cooked just right. Katy thought the Spicy Tomato Sauce could have been a bit spicier. There were nine of us at the table so it was a bit busy for me to take everything in but I know we all enjoyed the food and the company. Other favorites at the table included the East End Stomp and the B.o.B Mac-N-Cheese. I should mention the prices were very reasonable and the service was excellent. The wait staff was friendly, attentive, and very helpful. After dinner Katy and I headed to Virgil and Greek Peak Mountain Resort where we spent the night at Hope Lake Lodge. The lodge is located on Route 392, right across the street from the ski center. The lodge main entrance is protected by a large portico where you are greeted with full valet and bell service. The main lobby is a large, rustic great room with a huge stone fire place and chimney in the center. A restaurant and bar are located to the left with the front desk and hallway to the rest of the lodge to the right. It is certainly what I would expect a mountain lodge to look like. There are five floors that hare home to a spa, conference center, exercise room, children’s activity center, and of course, the guest rooms. On the back side of the lodge is the Cascades Indoor Water Park. Condos are available either by booking like a traditional hotel or though fractional ownership. With fractional ownership, you purchase a one-quarter share in a condo which entitles you to thirteen weeks of deeded ownership and use of the lodge facilities. There are 149 condo units with nine styles to choose from. Our condo was a one bedroom loft that sleeps up to six people. The loft featured a queen size bed and had a bathroom with a shower. The main level had a living room complete with a gas fireplace, sofa with pull out sleeper, a Murphy bed, and dining table. Also on the main level was a kitchenette with a stove, refrigerator, microwave, coffee maker, sink, dishwasher, and was adequately stocked with dishes, cups, glasses, and silverware, and utensils. A full bathroom was just off the kitchenette and a balcony with a view of the ski slopes was located off the living room. The accommodations were very comfortable with plenty of room for four people. It would be a bit tight for six people with the Murphy bed and pull out sofa opened but roomy enough otherwise. The rustic décor followed the theme of the rest of the lodge and was very cozy. The only problem I had was getting the gas fireplace to light. There were no written directions to be found and a call to the front desk didn’t help either. I didn’t press it because it was plenty warm without it but definitely would have needed help if I had my heart set on sitting in front of the fire after a long day of skiing. The room included six tickets to the Cascades Indoor Water Park which we took advantage of by inviting my brother, sisters, and nephews to join us for the evening at the park. The 41,000 square foot park features several water slides appropriate for toddlers to adults, a wave pool, a multi-level activity zone with a 500 gallon deluge bucket, activity pool, wading pool, indoor/outdoor hot tubs, and an outdoor pool. There were plenty of chairs to lounge around in while you watch the fun and well staffed with life guards so you don’t have to worry about the kids. There was plenty of water action for everybody. I even tried out the three story water tube which twisted its way down in the dark. It was fun to be 12 years old again. My only complaint is that the hot tubs were small and oddly shaped. It would be nice if they were a bit larger and had one reserved for adults only, something I’ve experienced at other resorts. The outdoor pool was a good size and well heated. I bet its great in the winter. Katy and I enjoyed breakfast on the balcony the next morning. Even though the lodge was busy with guests, it was very quiet and peaceful on the balcony. The Virgil Hills are beautiful. I wish we had more time to explore the lodge. There’s the Acorn Grill, a traditional family restaurant, the Bobcat Lounge offering a fully stocked bar and light menu fare, and the Edgewater Café located next to the water park for grabbing a quick snack while at the park. Waterfalls Spa offers complete spa packages including manicure, pedicure, facials, massage, teeth whitening, the list goes on and on. I’m sure you could find something to pamper yourself there. Just up the hill from the lodge is Hope Lake Park where you can find a guarded swimming beach, canoe rentals, fishing, a pavilion, and picnic facilities. There certainly is a lot to do all year around. If you’re planning a Finger Lakes vacation, definitely check out Hope Lake Lodge and Greek Peak Ski center. Be sure to stop for a bite to eat at Brix Pubaria as well. This entry was posted in 3. Food, 5. Regional Attractions and tagged Brix Pubaria, Central New York, Cortland, Finger Lakes, Greek Peak, Hope Lodge, Ski Resort, Wine, Wineries. Bookmark the permalink.